Rare earth minerals or rare earth elements (REEs) consist of the fifteen elements that make up the lanthanide group plus yttrium and can be found in more than 250 ore minerals in specific regions across the globe. They are used in many modern applications including rechargeable batteries that power electric and hybrid vehicles; as catalysts in petroleum refining; in high-strength permanent magnets for motors, computer disk drives, printers and speakers; and in metal and glass additives used in electronic displays and military instruments including night-vision goggles, GPS and communications equipment, and other defense gear. Increased demand for the different products manufactured from REEs has resulted in a shortage of supply. ArrMaz is equipped to help you process REEs more efficiently. The primary REE-bearing minerals that have been processed on commercial scale are bastnäsite, monazite, and xenotime. The principal separation techniques used to beneficiate rare earth minerals include combinations of magnetic separation, electrostatic separation, gravity separation and froth flotation. Froth flotation is commonly applied to rare earths because this process makes it possible to process a relatively wide range of fine particle sizes, can be tailored to the unique mineralogy of a specific deposit and has been used successfully in multiple locations. ArrMaz has proven expertise in froth flotation and our metallurgical labs can work with you to develop the best collector and flowsheet for your unique rare earth minerals ore.
New rare earth deposits are currently being developed to help meet market demand, however, most of these developing deposits include rare earth minerals for which there is limited processing knowledge. Apart from monazite and bastnäsite, there is very little research available on the flotation of rare earth minerals such as xenotime, and even less research available for some of the newer, more complex ore deposits. 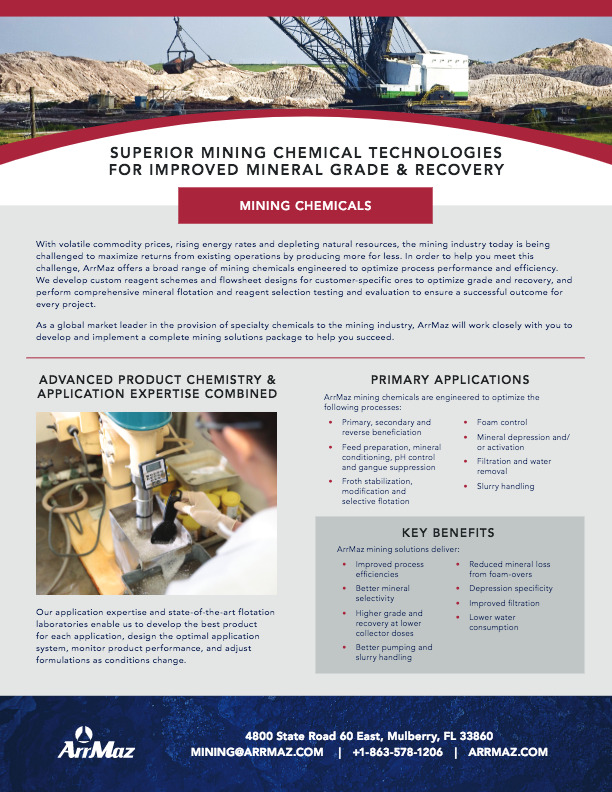 Due to the diversity and complexity of rare earth mineral deposits, it is important to work with a specialty chemicals company with experience in developing mining chemical technologies specifically for rare earth minerals. ArrMaz can specially formulate a flotation reagent suite to meet your unique needs and can further enhance its efficiency by realizing synergies through the custom design of a collector / depressant package for your specific rare earth mineral ore. Send us your rare earth ore and let us custom-formulate a reagent scheme and flowsheet design to enable you to process rare earth minerals more efficiently from ore deposits which may currently be under-utilized.